Posted on February 11, 2019 by Lauren Updyke. This entry was posted in Promotions. Bookmark the permalink. Join The Whole U as we celebrate a month full of fresh events, ideas, and approaches for eating well. 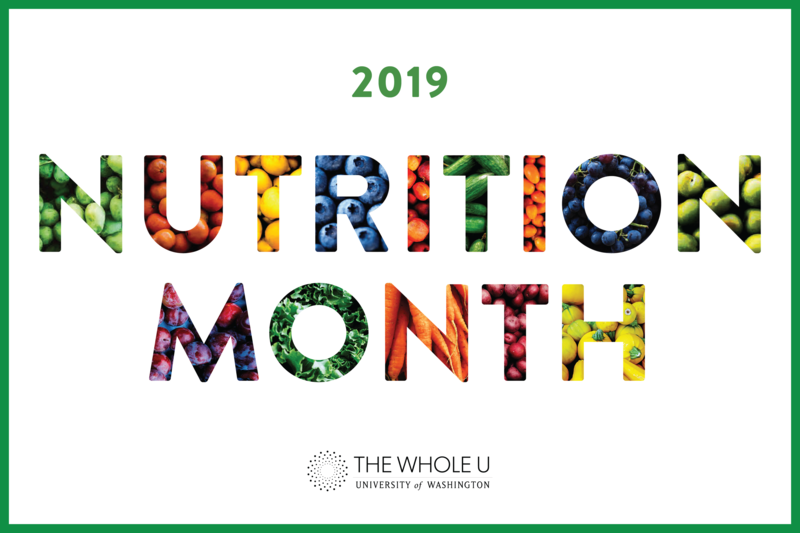 This year’s activities include a department/team healthy potluck competition, a 31 Days of Fruits and Vegetables Challenge, a 31 Day Nutritional Tracker, the opportunity to have your nutrition-related questions answered by one of UW Medicine’s registered dietitians, and additional events led by nutrition experts. Register for one or all of the the following activities to reap the benefits of adding more fruit, vegetables, and balance into your daily routine! Commit to 31 Days of Fruits and Vegetables – Register here! A daily email with tips on simple ways to incorporate fruit and vegetables into each meal. 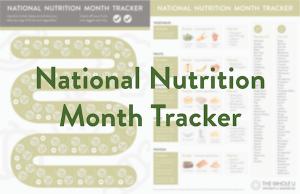 A month long National Nutrition Month Tracker to follow along each day of March, including recommended serving sizes, food group examples, and fruit and vegetable lists A-Z! Two simple recipes each week – one featuring a unique vegetable dish and a second featuring a tasty and healthy fruit treat! 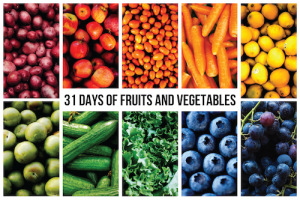 A 31 Days of Fruit and Vegetables handout at the end of the month. The opportunity to win “Farm Bucks” from the University District Farmers Market by sharing your favorite recipes and tracking your progress. 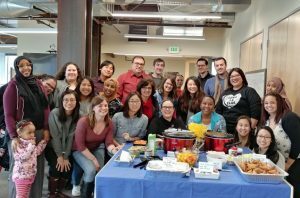 Host a Team Potluck – Register here! The Whole U invites departments and teams to host a healthy team potluck. In 2018 we had over 200 teams participate and share their favorite healthy recipes with each other. Let’s try to get over 250 teams this year! 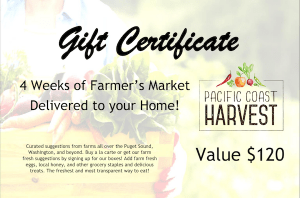 The winning team receives a $120 gift voucher from Pacific Coast Harvest! Host your potluck any day during March, where everyone brings a healthy dish to share. Capture a photo of your potluck and share it with us on Facebook, Twitter or Instagram using the hashtag #WholeUpotlucks, or email it to us at wholeu@uw.edu for a chance to win a team prize from Pacific Coast Harvest. For more vegetables, sign up for UW Medicine’s Veggie Madness! Veggie Madness returns this March with more produce-packed competition and healthy eating tips from the experts at UW Medicine — just in time for National Nutrition Month. Fill out a bracket and follow along as gorgeous greens, ravishing roots, lovable legumes and wholesome wildcards face off in this epic tournament of fiber. Can you predict which vegetable will reign supreme? Be sure to check this page again closer to March for additional information on prizes and events! I am interested in this. Who can I talk to about it?